The North Star House is a 10,000 square foot mansion, designed by Julia Morgan and is on the State and National Registers of Historic Places. This honor was bestowed because of the architectural importance of both the architect Julia Morgan, and a premier example of the Bay Area First Traditional Arts and Crafts Style. In the late 1800’s and early 1900’s the Craftsman movement that originated in England had come to the United States. It was a progressive social movement in response to the Industrial Revolution and the mechanization of many forms of cultural expression such as ceramics, furniture and architecture. The essence was to bring back hand craftsmanship and naturalism as common usage instead of machine made things. On the West coast both Berkeley and Pasadena were hot beds of this ideal. Practitioners were dedicated to healthy outdoor activities, growing vegetables and flower gardens, eating natural food, wearing hand made clothes, eating off of hand made pottery, and using handmade utensils. The architecture of this movement was to emulate the outdoors and build using locally available materials and the craftsmanship of artisans. There were a number of early adaptors like architect Bernard Maybeck in Berkeley, and architect / builders the Green & Green Brothers in Pasadena. Julia Morgan was educated in Berkeley and Oakland during the rise of this movement and greatly influenced by these early practitioners. she also had obtained a solid understanding of structural engineering while studying Civil Engineering at UC Berkeley. Later she attended Le Echole De Beau Arts in Paris, thanks to the efforts of Maybeck and Phoebe Hearst, who recognized her talent and brilliance. 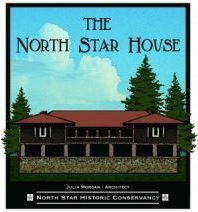 The North Star House is believed to be the second professional commission for the young woman who would soon become a recognized and successful architect. This was an unusual field of practice for a woman in those days. The North Star House, planned around a courtyard, reflects the formality and symmetry she learned at Le Echole, a school based upon traditional classical European architecture at the time. The exceptional innovation is the extensive use of local indigenous materials which are the essence of both Organic and the Craftsman architecture. In some ways the structure seems to blend with and grow out of the site. Julia Morgan made use of the round natural ponderosa pines growing on the property for structural columns. The walls and floors are made of Douglas fir trees that grew on the site, and most of the interior wood paneling and trim is made of local native cedar. All of the lumber used in the North Star House is made from clear old growth timber, wood that is unavailable or unaffordable for building today. The rock walls and round columns were crafted by Italian stone masons that she recruited from throughout the state. Their rock was “mined” from the tailings piles of the North Star Mine. A small railroad was constructed from the main head frame tailings pile from the rejected ore that did not have enough content to crush and process the gold. However, if you look closely there are glints of gold in the rock masonry. The roof was covered with redwood shakes imported from the coast where the great redwood forests once thrived. Few things were imported from outside California. The glass was imported from Pittsburg, Pennsylvania, where most glass was manufactured in those days The copper electrical wire and plumbing pipe were from mines in Colorado and other copper rich states. Cement was produced in California because mines and processing plants had been built to construct the mines and cities of Sacramento and San Francisco. The mines were the cutting edge of industrial technology in that era, and Grass Valley and Nevada City were the “Silicon Valley” of the day when many inventions were created, such as the Pelton wheel, used to generate electricity for running the lights, motors and pumps of the deep mine shafts. Julia Morgan was a master of engineering design with concrete and the miners were masters of building strong durable reinforced concrete buildings, dams and emplacements for the heavy machinery used to extract and crush the gold ore. The reinforced concrete foundations of the North Star House are extensive where often stone masonry would have been used, and testify to the long undamaged standing of the house. Inside Miss Morgan was very advanced in using thick concrete plaster and metal lath on both sides of the interior walls. This technique not only made the walls hard and durable, but sound proof and virtually fireproof. These techniques were precursors to how buildings would be reinforced and fireproofed after the great earthquake of 1906. It is still used today for most buildings.